"It's fast, It's slow, It's mature, without being boring; it rocks, even when it's doesn't. It's also one of the best albums of 2013, if not the best." — Kerrang! In 1991, Pearl Jam's debut album, Ten, catapulted the little-known Seattle-based band into superstardom. Nine studio albums, hundreds of unique live performances and hundreds of official live concert bootleg releases later, the band continue to be critically acclaimed and commercially successful — with more than 60 million albums sold worldwide. Their much-anticipated 10th studio album, Lightning Bolt, is on Monkeywrench Records/Republic Records. 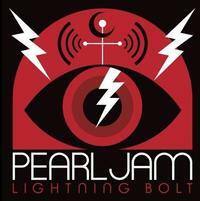 Produced by Brendan O'Brien, Lightning Bolt marks Pearl Jam's first studio album since the highly acclaimed Backspacer, which was released nearly four years ago in September of 2009. "Perhaps it's destined that a band who considered The Who and Neil Young idols would have no quarrel with middle age; nevertheless, the settled nature of Pearl Jam's Lightning Bolt comes as a bit of a jolt. Long ago, Pearl Jam opted out of the rat race, choosing to abandon MTV and album rock radio, ready to take any fans who came their way, and in a way, Lightning Bolt — their tenth studio album, arriving 22 years after the first — is a logical extension of that attitude, flirting with insouciance even at its loudest moments. Often, this record seems to ignore the very idea of immediacy; even when the tempos are rushed and the amplifiers are revved up, Pearl Jam never quite seem to be rocking with abandon, choosing to settle into comforting cacophony instead. Then again, nothing on Lightning Bolt — not the wannabe breakneck rocker 'Mind Your Manners,' not the tightly coiled title track, not the glam stomp of 'Let the Records Play' — proceeds with any manner of urgency, with even the loudest rockers unveiled at a measured pace that allows plenty of space for solos by Mike McCready.